These two, 2-storey chalets offer great flexibility in sleeping arrangements. There is one bedroom upstairs and one down. Four zip lock mattresses can combine to form two queen size beds, making the chalets perfect for two couples, four singles or combinations. There are two extra mattresses. The chalets are fully self contained, with gas stove, microwave, kettle, toaster, CD player, glass fronted log fire, washing machine, cot, high chair, BBQ, games, books and child- proofing. 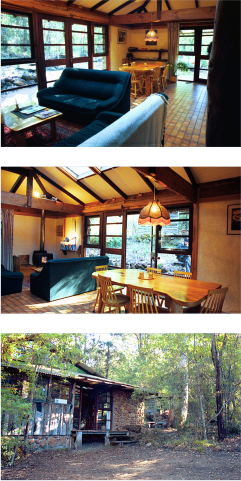 School hols & long w/ends: $240/night for up to 4 people (min 3 nights). Prices apply from 1st Feb 2017 and include GST.